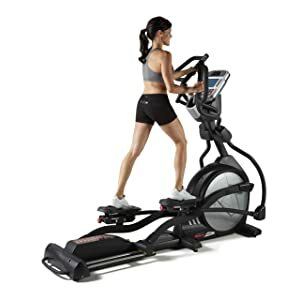 Often considered the big brother of the Sole Fitness E35 Elliptical Machine, the Sole Fitness E95 Elliptical Machine is not just an upgrade on the E35, but brings with it some significant new features which can justify the fact that its price is somewhat on the higher side as far as home elliptical machines re concerned. In the process of integrating new features, this elliptical machine has been endowed with a few specifications which are truly record breaking, such as the ramp incline and the flywheel weight, while keeping the overall machine weight within reasonable limits. These tend to make it superior to the competition in this price range. Like the Sole E35, the Sole Fitness E95 Elliptical Machine comes with a sturdy frame made of heavy duty steel tubing that has been moulded along ergonomic lines to ensure balance and maximization of elliptical machine benefits. What really sets this machine head and shoulders above the competition is the incline of the ramp. At 30 degrees, it is the highest available for any elliptical machine in this price range (and any price range for that matter). This record setting incline coupled with the motorized ramp angle alignment that is the hallmark of the higher end Sole machines, makes the Sole Fitness E95 Elliptical Machine one of the most versatile exercise machines available. This is because steeper the ramp angle, more the muscle groups involved and more the calories burnt. On the other hand, those with weak muscles or injuries can opt for a simpler exercise as well. Despite this unique feature (as well as a heavy flywheel which is discussed later), the Sole Fitness E95 Elliptical Machine weighs the same as the E35 – 215 pounds. As we mentioned in the E35′s review, this is slightly on the higher side, but not intolerably so, and this added weight in fact improves the balance and stability of the machine. With dimensions of 27 by 62 by 83 inches (WxHxD), this elliptical machine is not one that will take up too much floor space. On the other hand, this machine boasts of a whopping 400 pounds user weight capacity, which easily beats other machines. Add to this the magnetic eddy current braking system of the 20 resistance levels available on this machine, and you have a machine that boasts of both capacity and variety. As always, Sole provides you with a lifetime warranty on the frame itself, and five year warranties on electrical and mechanical parts. Labor warranty is also a industry beating two years. The Sole Fitness E95 Elliptical Machine provides the two pairs of handlebars – one static and the other moving – as is expected in this price range. Like all of Sole’s products, the quality of the build is premium and design is ergonomic for maximization of workout benefits. Like the E35 elliptical machine, there are pulse rate monitors in the static handlebars. Most elliptical machines in this price range have a great sound system for playing music from iPads, etc. and the Sole Fitness E95 Elliptical Machine is no exception to this rule. A powerful but quiet fan has been provided to cool you down when you’re sweating away during a workout. Most importantly, however, the elliptical trainer comes with a 34lb flywheel, which is amongst the highest available in the industry, and possibly the highest available in any price bracket for home elliptical machines. As we know, the higher the weight of the flywheel, the better the stability and smoothness, because the weight adds to the inertia and prevents instability. Like most good elliptical machines, the Sole Fitness E95 Elliptical Machine has a 20-22 inch stride length, which should be sufficient for all but the tallest of people. Like the E35, the E95 has specially designed footplates to ensure a good workout without overstraining vital ligaments and muscles or putting excess pressure on Achilles heel nerve endings. Indeed, Sole Fitness has collaborated with top fitness specialists to create footplates that have a two degree angle and over ten different positions, thus allowing the machine to be used by people with virtually any foot shape and size. The Sole Fitness E95 Elliptical Machine has a 9 inch LCD monitor with blue backlighting to ensure that the data is visible clearly at all times. In fact, a 9 inch display is extremely rare even amongst higher end commercial elliptical machines. Available programs is probably the only area where this elliptical machine falls short of expectations. Considering the price range, it gives only six automated programs and three user defined ones. In comparison, the E35 gives 25 programs. However, the few programs offered by Sole include the heart rate monitoring system, with the wireless chest strap being provided in case the user prefers not to use the fixed handlebars. An ergonomic design, coupled with padding on the handlebars and the footplates ensures that workouts are never an uncomfortable experience with the Sole Fitness E95 Elliptical Machine. Further, the magnetic resistances and heavy flywheel ensure smoothness, thus improving the comfort significantly. Footplates have been specially designed and angled inwards for user comfort and maximum exercise benefits. Though the price tag may appear slightly on the higher side, the Sole Fitness E95 Elliptical Machine more than justifies itself as the flagship product of Sole Fitness by providing record-breaking specifications inflywheel weight, ramp incline, monitor size and user weight capacity. Indeed, it is truly hard to find an elliptical machine with so many good features combined together. Together with excellent build and sufficient warranty, the features can provide great value for money to any user who is seeking a premium home elliptical machine with top of the range specifications.